Situated on the Mid-Atlantic coast, Virginia has seen its fair share of hurricanes and tropical storms throughout its history. We all have memories of the more recent storms like Isabel and Irene. 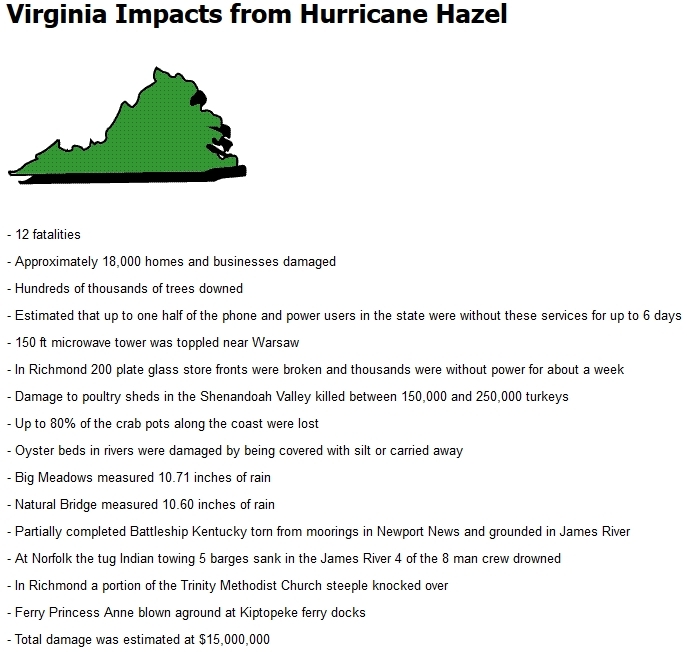 But which Virginia hurricanes have been the most destructive and costly to our state? Hurricanes were not named before 1950, so this storm from the end of the nineteenth century is known only as the “Great Hurricane.” The hurricane reached Category 3 at its most powerful. It formed over the Lesser Antilles and traveled northeast into the Gulf of Mexico where it changed course and moved northeast to make landfall on the Florida Panhandle. The storm continued to move north through the East Coast states, reaching Virginia on September 29 and eventually dissipating over Pennsylvania. There was tremendous property damage in Virginia, mainly from the wind. Homes and businesses were damaged or destroyed. Telegraph lines fell, and roads were blocked by debris. Hundreds or thousands of trees were downed, many snapped off 10 to 15 feet above the ground. Hurricane Ernesto was a Cape Verde hurricane that only briefly reached Category 1 status over the Caribbean Sea. It moved north as a tropical storm and made landfall on August 30 in the Florida Keys before moving out to sea again, still moving northward. Ernesto gained strength and made landfall again on August 31 near the North Carolina/Virginia border with wind speeds of 69 mph, although it weakened quickly after this and was downgraded to a tropical depression. The storm weakened further and dissipated over southern Virginia later that day. Though technically only a tropical storm when it reached Virginia, Ernesto caused plenty of damage. Most of the damage from the storm was the result of flooding, and some areas reported up to 12 inches of rain. There was some wind damage reported as well. Two Gloucester residents were killed when a tree fell on their home, and two traffic deaths are also attributed to the storm. Hurricane Gaston was a Category 1 hurricane that formed off the coast of the Carolinas and made landfall in South Carolina on August 29 before moving north. The storm stalled over Central Virginia during the afternoon and evening of August 30. Already weakened to a tropical depression, Gaston dissipated soon afterwards. Gaston was one of the most damaging storms for Central Virginia specifically. The storm caused extensive flooding in the Richmond, Virginia area, particularly downtown, in and around the Shockoe Bottom neighborhood. Eight people were killed due to the flooding in Richmond, which completely overwhelmed the city’s drainage system. The city received 14 inches of rain in a matter of hours, and water levels reached nine feet or more during the height of the flooding. 350 homes and 230 businesses were damaged or destroyed by the storm. Hurricane Hazel was a Category 4 hurricane that formed in the southern Caribbean on October 5, 1954. It traveled over the island of Haiti, causing devastating damages and killing at least 400 people, then continued north towards the Atlantic coast. Hazel made landfall in the Carolinas on October 15, still at its Category 4 strength, and traveled north. It continued through Pennsylvania and New York before turning northwest and heading into Canada near the Great Lakes where its remnants were eventually absorbed into another storm. Due to the storm traveling very quickly, damage in Virginia was far less than it could have been. Record wind gusts were recorded all over the state, and most damage was wind-related. An estimated 18,000 homes and businesses were damaged, and roughly half of all phone and power customers were out of service for up to six days. Hurricane Irene was a Cape Verde hurricane that struck the Bahamas at its peak strength as a Category 3. Irene then turned north, heading for the East Coast, and made landfall on August 27 in North Carolina as a Category 1 hurricane. The storm continued north through Virginia and all the way to New England. It dissipated over Vermont on August 29. Hurricane Irene first struck Virginia’s coastal region and caused some flooding and wind damage in the area. Hampton Roads experienced the worst flooding, with water levels comparable to Hurricane Isabel in 2003. The greatest damages, however, occurred in the Richmond, Virginia area. Strong winds caused the second largest power outage in Virginia history. Thousands of homes were damaged, many trees were downed, and over 200 roads had to be closed. Ten motorists were trapped near Richmond National Battlefield Park for several hours due to fallen trees blocking both directions of Virginia Route 5. The storm gave rise to at least one tornado, which caused significant damage in Virginia Beach. Tornadoes were also reported in New Jersey, Maryland, and Delaware. Just four days earlier, on August 23, Virginia was hit with a 5.8 magnitude earthquake. Seismologists suggest that the heavy winds from Irene may have triggered or worsened the quakes aftershocks. Aftershocks typically decrease in frequency following an earthquake. However, seismologists observed that the rate of aftershocks increased significantly in Mineral, Virginia during the storm. Hurricane Fran was a Cape Verde hurricane that moved west across the Atlantic from the African coast. Fran remained disorganized for some time due to the proximity of Hurricane Edouard. Once Edouard moved out to sea, though, Fran became more powerful and made landfall in North Carolina as a Category 3 hurricane. The effects of Hurricane Fran were felt all across Virginia, but particularly in the western regions. These areas received up to 16 inches of rain, and the Rappahannock River had a storm surge of 5 feet. Significant flooding occurred, which destroyed around 300 homes. Additionally, approximately 100 people were rescued by emergency services. The worst flood damage occurred in Paige County, where hundreds of homes were destroyed or damaged and many residents were stranded due to the floodwaters. Hurricane Floyd was a Cape Verde Hurricane that neared Category 5 strength at its most powerful, over the Bahamas. After passing over the Bahamas, Floyd turned northward and moved parallel to the East Coast, making landfall as a Category 2 hurricane on the North Carolina coast. The storm weakened as it moved north through Virginia and dissipated over New England. In Virginia, most damage from Hurricane Floyd was due to flooding, mainly in the southeastern region of the state. Southampton, Sussex, Isle of Wight and Surry Counties were hit the hardest in this storm. Rainfall in these areas was between 10 and 20 inches, causing massive flooding. Over 300 roads were closed, and widespread power outages occurred. Much of the devastation can be attributed to Floyd’s unusual size. Hurricane Floyd was nearly twice as large as a typical storm of its strength, thus allowing for more rainfall and increased flooding. Hurricane Agnes was an early-season hurricane that developed over the Gulf of Mexico in mid-June 1972. Agnes was complicated by other depressions and fronts during its life cycle that may have increased its destructive power. The storm made landfall on the Florida Panhandle on June 19 and moved north over the next few days. On June 21, Agnes moved back out to sea, increasing in strength again before making landfall a second time on the coast of New York on June 22. It moved west over New York state and Pennsylvania before being absorbed into a low-pressure system by the morning of the 23rd. Agnes caused extensive flooding in much of Virginia, as well as Maryland and Pennsylvania. 10-16 inches of rain were reported across the state, with the highest levels recorded in Fairfax County. In Prince William County, over a thousand residents were left homeless due to flood damage. The Potomac and James Rivers both flooded. Due to flooding on the James, Richmond suffered extensive damage. Four out of the five bridges crossing the James River were destroyed. 200 blocks of downtown Richmond were flooded, and floodwaters crested well above the city’s seawall. The Chesapeake Bay also suffered enormous damages. Agnes filled the Bay with an overabundance of fresh water, killing many salt water marine animals, which disturbed the ecosystem and caused huge losses for the local seafood industry. The storm also deposited a massive excess of sediment into the bay. Scientists believe that damage from Hurricane Agnes contributed to the decline of the Chesapeake Bay, from which it has not fully recovered, even now. Hurricane Camille was one of only three Category 5 hurricanes to hit the United States during the 20th Century. Camille made landfall on the Mississippi coast, devastating that area with sustained winds up t0 190 mph and tides as high as 30 feet. From there, the storm moved northwest for a time before turning east and moving towards Virginia. The storm lost much of its wind strength and cyclonic power as it traveled over land, entering Virginia as a tropical depression on August 20. Due to Camille’s weakened status, Virginians were unprepared for the torrential rains and devastating flooding that occurred. Over 100 bridges washed out in Nelson County, and communication was completely cut off between the Shenandoah Valley and Richmond for a time due to storm damage. Large portions of Western and Central Virginia received record rainfall – as much as 31 inches. Most of this rainfall happened within three to four hours over the mountains of southwest Virginia. Flash flooding and mudslides resulting from this massive rainfall caused 123 deaths in Nelson County alone, and 30 other deaths in the surrounding areas. Camille is still considered the deadliest natural disaster in Virginia history. The Chesapeake-Potomac Hurricane was a Cape Verde hurricane that reached as high as Category 4 status as it moved west across the Atlantic Ocean. However, it had dropped to a Category 2 by the time it made landfall on the coast of North Carolina on August 23. The storm weakened over land, but maintained its hurricane status as it moved over Virginia, only dropping to a tropical storm around the time it passed over Washington, D.C. It continued to move north along the East Coast and dissipated near the Canadian border on August 25. The most severe damage occurred in the Tidewater region, including Norfolk and Virginia Beach. A combination of storm surge, flooding, and high winds wreaked havoc on the area. Homes and businesses, as well as boats and piers, were damaged and destroyed. Hundreds of trees were downed, some over 100 years old. Significant crop damage also occurred, mainly to tobacco and corn crops. Following the storm, communication was difficult or impossible thanks to power and telephone outages, as well as washed out roads and bridges. 79,000 people lost telephone service during this storm. Hurricane Isabel was a Cape Verde hurricane that formed quickly and moved northwest across the Atlantic Ocean. At its most powerful, it maintained Category 5 status for over 30 hours. Isabel made landfall as a Category 2 hurricane on September 18 near the Outer Banks in North Carolina. The storm continued up the coast, maintaining considerable power as it moved through Virginia. Isabel continued moving northwest through West Virginia and dissipated over Pennsylvania in the early morning of September 20. Mandatory or recommended evacuations were issued for 17 counties in the coastal region. Many others chose to evacuate. The College of William and Mary in Williamsburg closed their campus and evacuated students and faculty, an unprecedented incident in the university’s 300-year history. Flooding from storm surge and rainfall was severe. The highest rainfall recorded was 20 inches in Augusta County. Isabel caused the worst flooding in southeastern Virginia seen since the Chesapeake-Potomac Hurricane in 1933. The storm also created 20 million cubic yards of debris, the equivalent of 660,000 dump trucks full. 100 localities were declared major disaster areas during and in the aftermath of the storm. The majority of the damage from Hurricane Isabel occurred in Virginia, and the storm is the most costly disaster in Virginia history. The storm destroyed or severely damaged over 10,000 homes, with over 100,000 homes suffering minor damage. Over 1,000 businesses were also destroyed or severely damaged. 1.9 million electrical customers lost power, many for over a week and some for two weeks or more. The damage was worst in the coastal region, but severe damage extended into Central and Northern Virginia and beyond.